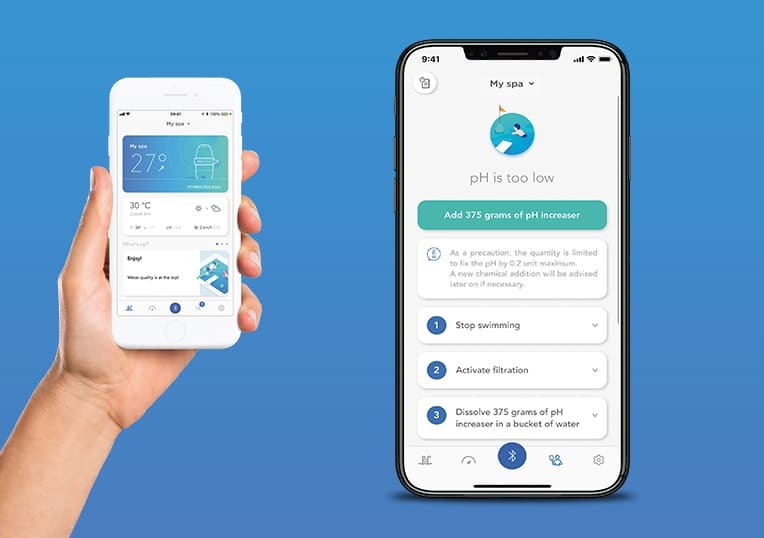 Blue Connect Plus is a smart analyser that controls the quality of the water in your hot tub and informs you about the number of products necessary to maintain it. All from your smartphone! The results of these analyses are reported automatically by sending notifications to your smartphone. Blue Connect Plus is automatically connected via the Sigfox network, without having to go through your home network. If it is not possible to access this network from your location, the Blue Connect can be connected to your Wi-Fi network using the Blue Extender accessory. Several times a day, Blue Connect Plus sends the data that has been measured via Sigfox. This data is collected and saved in a secure infrastructure ‘in the cloud’. It also allows you to take instant measurements at any time via Bluetooth. Accurate records: view a detailed log of the water parameters thanks to the data records. Weather forecast: plan the perfect time to enjoy your hot tub thanks to the integrated weather forecasts. Customised alerts: choose the water parameter limits and the time when you prefer to receive alerts. User management: monitor your swimming pool with the rest of your family thanks to the application’s multi-user access. With Blue Connect Plus forget about maintaining the water: simply follow the instructions given by the application to maintain the hot tub water clean, healthy and balanced. Blue Connect Plus is available for all hot tubs in our Premium range. Don’t forget to include this modern, game-changing water control system when requesting your quote.